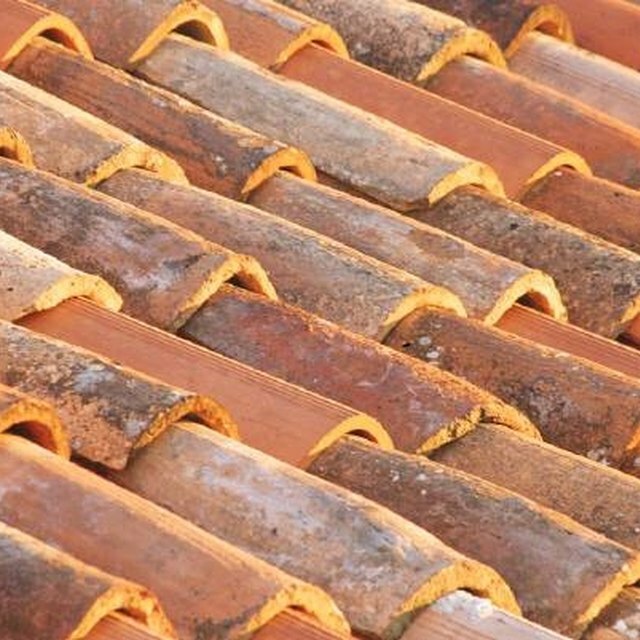 Roof tiles are both a practical and decorative way to protect a building from snow, rain and other elements. The tiles are secured to a base, frequently plywood or wood strips, which covers roof rafters. The elements, however, sometimes damage tiles. Winds rip loosely secured tiles off the roof. Water penetrates small openings and causes leaks. Tree limbs crash on the roof and crack tiles. Repairs can be handled by the homeowner if he can reach the damaged area from an extension ladder. Damage beyond this reach should be handled by a contractor. The most common tiles, slate and clay, each require different tools and different repair steps. Remove the nails under a damaged slate roof tile by slipping a slate ripper under the tile until you hook a nail. Use a hammer to strike against the ripper's knee to pop the nail. Most slate tiles have two nails. Slip the new tile into place and mark the gap between the two tiles immediately above it with a nail set. Make two nail holes along this line on the backside of a new tile. Position the new tile so it is aligned with the other pieces in its row. Drive galvanized steel nails through the nail holes with a hammer to secure it to the roof base. A copper bib, which is a rectangular piece of metal about 3 inches high and 5 inches long, can be added to protect the new nail holes and nails from water damage. Slightly raise the two tiles above the new tile with two flat-head screwdrivers and slip in the bib. The curve of the bib holds it in place. Clay tiles come in various shapes from flat to half-round. Most have interlocking pieces, which make them difficult to replace. Remove the broken tiles and dig away the old mortar with a cold chisel and ball-peen hammer. This kind of hammer has two ends made from metal. One is shaped into a ball to straighten, soften and expand metal into the desired shape. The other end is straighter to strike chisels. If this hammer is not available, a regular metal hammer can be substituted. Mix and apply new mortar along the same lines of the old mortar trail. Place the new tiles in position in the same interlocking pattern, or any other pattern that follows the roof design. Trim the areas around the new tiles with a trowel. Allow to set. Check the work several hours later to determine if additional mortar is required to secure the tiles. If you are doing the repair, first determine how the tiles are secured to the roof base. Several examples are provided here, but roofers sometimes use other methods. Some tiles are hung onto other tiles and don't require nails. Make the repair to match the original roof installation. Mike Virgintino began as a broadcast journalist and has been a marketing communications executive for more than 25 years. A graduate of Fordham University in New York, Virgintino has directed corporate, nonprofit and product branding initiatives for many leading companies and nonprofits. His articles have been published in a variety of trade magazines and American history publications such as Civil War News.